It was during this month, while feeling separation from Krsna, that the gopis lamented, "We are not fortunate like the deer in this forest. People say they are foolish, but they are not so. We are foolish, because we don't know how to love Krsna like these deer. When prema is very high, it breaks all boundaries. These deer, although by nature very shy, have broken all boundaries by their intense love for Krsna. They gave up their shyness, they approached Him, and they are exchanging their hearts feelings with Him through their loving glances. We cannot do this, and therefore we are unfortunate. We will be lucky if we can die and take birth as deer in our next life. In that way we can see Krsna and approach Him when He is cow-grazing." In this month the gopis remembered that when Krsna plays on His flute in the forest, the cows become stunned. With eyes of transcendental emotions the gopis see both Krsna and the cows, and further lament in their mood of separation. They see that although it is the nature of animals to spend their time in eating, when Krsna plays His flute these cows forget to eat and instead pick up their ears to hear. Humans have very small ears, but cows have large ears, like cups. Through the cups of their ears these cows drink the nectar of Krsna's flute playing, and when they taste it they forget everything else. They have grass in their mouths, but they forget to chew. Even the calves, who were drinking the milk from the udders of their mothers, are like this. The milk is coming into their mouths, but they have forgotten to swallow. They simply stand with tears gliding down from their eyes, and they embrace Krsna in the core of their hearts. The love of the cows is not as high as that of the gopis, but due to the nature of their own prema, the gopis think the cows are greater. Those who are maha-bhagavatas, and what to say of maha-maha-bhagavatas like the gopis, see their own love and their own mood in all others. Yet they think, "I am unfortunate; I have no love." This is an example of Radhika's madanakhya-mahabhava (the highest ecstatic love for Krsna). Here She glorifies the aboriginal girls who live in the forest, and She says that they are lucky – whereas She is not. In the morning time, when they walk around Giriraja Govardhana, they see some red kunkuma powder on the grass and go to pick it up. This kunkuma came from the lotus feet of Krsnacandra when He was returning home in the early morning on the damp grass, but it originally came from the breasts of His beloved. The Pulindi girls think themselves to be very fortunate to obtain this kunkuma. Simply by their smelling the fragrance, Krsna appears in their hearts, and then they smear that kunkuma paste all over their bodies and faces and thus meet with Krsna in their hearts. There He fulfills all their desires. Radhika is thinking that these Pulindi girls are fortunate, but more fortunate is the grass because it was directly touched by Krsna's feet. Even more fortunate is that beloved gopi from whose breasts this kunkuma has come. That gopi is Radhika Herself, but because of Her madanakya-mahabhava she forgets this – and instead glorifies others. Govardhana-puja also took place in this month. All the Vrajavasis worshiped Giriraja Govardhana and performed Annakuta Mahotsava. Seeing this, Indra became very angry and created torrential rain, and Krsna cut away his pride. In this month, Indra came and worshiped Krsna after his pride was cut, all the demigods performed kirtana, and Krsna received the name Govinda. 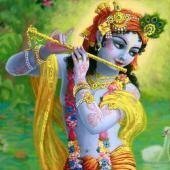 He began to play on His flute, and the flute sound entered the hearts of the Vraja gopis. They became mugdha, completely bewildered and, forgetting everything else, they ran into the forest to meet with Him. In this month, the gopis who were locked inside their homes were brought to Krsna by a mood of their very strong fire of separation from Krsna. By this viraha-tap, any imperfection in the moods of those who did not yet have sufficient association with the nitya-siddha gopis was completely burned away. By deeply meditating in intense separation they at once met with Krsna in their hearts and embraced Him. These sweet pastimes took place in this month. This verse is so sweet and powerful that when Shri Caitanya Mahaprabhu heard it from the lotus mouth of Maharaja Prataparudra, He told him, "You have given me so many valuable jewels. I have nothing to give you in return; I have only have my self, so I am embracing you." When Mahaprabhu embraced Prataparudra Maharaja, the bhavas and sweet meanings of the verses of Gopi-gita manifested in his heart. Krsna said, "O My dear gopis, you have left all other obligations, including your families, and all other dharmas for me. This is very difficult to give up, but you have left all this for my happiness only. Therefore, even if I have a lifetime as long as Brahma, and even if I will serve you for many such lifetimes, still I would not be able to repay you. I would always be indebted to you for the love you have given me." Bhagavan Shri Krsna is the Supreme Personality of Godhead, He is transcendental and His katha (descriptions of His glories and pastimes) is very powerful. Of all types of such katha, the katha of His servants is more powerful, the katha of his friends is more powerful, the katha of his parents in vatsalya-bhava is still more powerful, and the katha of His sporting with the young brides of Vraja is the highest and most powerful katha. It is so powerful that if even a fallen or sinful person hears it with faith, it can purify him. If one understands this and hears this katha, gopi-prema must enter into that person's heart, kick aside all anarthas, and turn him into a parama-bhagavata, topmost devotee. In this month, Krsna killed the demon Sankasura and cut the jewel from his forehead. He then entered the company of all the gopis, who were all wondering to whom He would give that jewel. Krsna was thinking, "If I give the jewel to one, the others will be upset." Therefore, to avoid an argument among the gopis, Krsna gave the jewel to Baladeva Prabhu, who gave it to Madhumangala, who gave it to Shrimati Radhika. In this month Krsna killed Aristasura, and as a result of that killing Radha Kunda and Syama Kunda were manifest. That pastime took place today, (Oct 28th) and this holy day is called Bahulastami. In this month, Krsna killed the demons Kesi and Vyomasura, and in this month Akrura came to Vraja and took Krsna and Balarama to Mathura. Krsna also killed Kamsa in this month. In this month Krsna and Balarama performed the upanaya-sanskara (sacred thread ceremony). Because they had been brought up in Vraja, they have the mood that, "I am a cowherd boy and Mother Yasoda and Nanda Baba are My parents." However, Vasudeva and Devaki think, "We are the real parents of Krsna. It is part of the Vedic tradition that parents arrange for the upanaya-sanskara of their child, so if we arrange this function for Krsna, the impression will come in his heart that, "Vasudeva and Devaki are My parents." They tried to do this, but they failed. Krsna had already received the Radha mantra from Bhaguri Rsi. He received this mantra when He was in Vraja, but at that time He had no upanaya-sanskara. 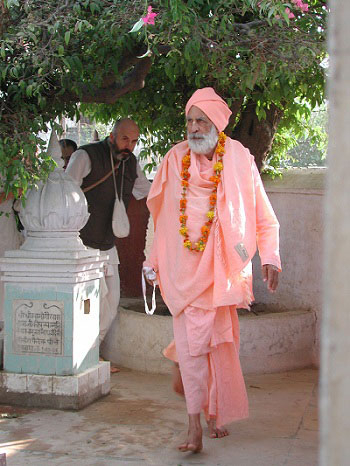 His upanaya-sanskara was performed in Mathura according to the duties of ksatryas. Gargacarya gave Krsna the brahma-gayatri mantra, and when Krsna heard this mantra He fainted. Why? Radhika is the predominating deity of gayatri. Then, after His fire yajna, Krsna was looking for his mother and called out, "O Mother, where are you?" Devaki was standing near Him, but Krsna did not approach her – for He was looking for Mother Yasoda. In this way, although the Mathuravasis made the plan to give Krsna the sanskana that He is the son of Vasudeva and Devaki, it failed. This pastime took place in this month. Shri Narada Rsi received the benediction from Krsna that those who will hear His sweet lila-katha in the places of His pastimes, especially during this Kartika month, will surely attain krsna-prema very soon. We should therefore have confidence; we need never become hopeless. We should know that by performing all these simple activities – offering a ghee lamp every day, attending mangal-arati, performing kirtana, singing Shri Damodarastakam, doing parikrama, offering maha-prasada, observing Annukuta Mahotsava, hearing hari-katha in all the pastime places – there is no doubt about success. It is only a question of time, and that time will not be very long. We will attain Krsna-prema and thus serve Radha-Krsna Yugala.